As a digital sociologist, I have become fascinated by the social and cultural implications of 3D printing technologies. Few sociologists or any other critical academic commentators have begun to investigate how 3D printing is beginning to affect society. Yet as 3D printing technologies move into an expanding realm of contexts, there is much opportunity to analyse their effects. Not only are these technologies having an impact on industrial manufacturing and the distribution of goods, makers, artists and designers are taking them up in intriguing ways. 3D printing is being used in medicine and dentistry, public relations and marketing and in fan cultures. These technologies are being introduced into schools and incorporated into the curriculum. As the price of 3D printers falls, they will become an addition to more households. There are significant environmental and legal issues in relation to how they are used, including questions about intellectual property. As part of my initial explorations into the sociology of 3D printing, last week I published two pieces on these technologies. One was an article for The Conversation, in which I discussed the phenomenon of the 3D self replica. This is a figurine that can be made of a person using the digital data derived from 3D scanning software. The technologies to generate these artefacts are rapidly moving into a range of leisure domains, including sporting events, shopping centres, airports, concerts and amusement parks as well as fan cultures and marketing programs. 3D printed self replicas can even be made at home using a software package developed for the Xbox Kinect game box and a home 3D printer. Some commentators have referred to these replicas as ‘3D selfies’ because they involve the production of a personal likeness. In the article I speculated about the ways in which people may start to use these figures as markers or mementos of their bodies and social relationships. The advent of 3D printing technologies has generated new ways of representing and conceptualising health and illness, medical practice and the body. There are many social, cultural and political implications of 3D printing, but a critical sociology of 3D printing is only beginning to emerge. In this article I seek to contribute to this nascent literature by addressing some of the ways in which 3D printing technologies are being used to convert digital data collected on human bodies and fabricate them into tangible forms that can be touched and held. I focus in particular on the use of 3D printing to manufacture non-organic replicas of individuals’ bodies, body parts or bodily functions and activities. The article is also a reflection on a specific set of digital data practices and the meaning of such data to individuals. In analysing these new forms of human bodies, I draw on sociomaterialist perspectives as well as the recent work of scholars who have sought to reflect on selfhood, embodiment, place and space in digital society and the nature of people’s interactions with digital data. I argue that these objects incite intriguing ways of thinking about the ways in digital data on embodiment, health and illnesses are interpreted and used across a range of contexts. The article ends with some speculations about where these technologies may be headed and outlining future research directions. These initial forays into a sociology of 3D printing represent merely a small component of possible avenues for theorising and research into the social impact of this technology. What I am particularly interested in at the moment is the implications for people’s data practices, or how the material objects that are generated from 3D printing technologies act as ‘solidified’ personal data. Future writings will investigate these issues in greater depth. 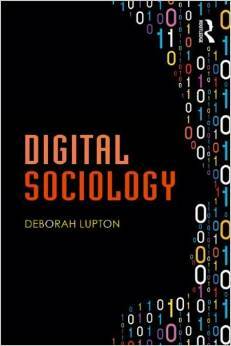 Digital Sociology has now been published (click here for the Amazon link and here for the publisher’s link).